Click to read a review of “The Abolitionists” by William Katz. In fact, Black abolitionists were central to the abolition movement and the ending of slavery. The leading abolitionist newspaper of the time, The Liberator, was funded largely by Black abolitionists and the newspaper’s subscribers were by and large African American. Three years after The Liberator’s founding, African Americans accounted for three-quarters of the newspaper’s 2,300 subscribers. To counter this invisibility, the Zinn Education Project features noted Black abolitionists on our Facebook page and online. We also offer the role play on the people’s history of the abolition movement, referenced above, which helps students learn a more accurate and empowering history of the fight to end slavery. 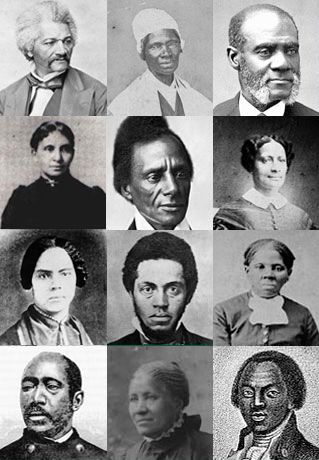 This collection is not comprehensive, indeed there are many more Black abolitionists who fought against slavery, assisted people in the Underground Railroad, or supported the movement in a myriad of ways. It is our hope that the role play and these profiles will encourage people to learn more about the significant role of Black liberators in the struggle against slavery. Teacher education student Tristan Brosnan prepared this introduction and the collection of images and short bios of Black abolitionists. Thanks for this! I’m so glad to see it. It will help me focus my pending discussion with my child’s 8th grade Oregonian history teacher as we enter Black History month. Are you familiar with Charles Brown, a black abolitionist who was executed by hanging in 1841 on an island near St. Louis? The event was viewed by approximately 20,000 people, some of whom chartered boats for the occasion and charged local residents money for the privilege of seeing Brown hanged, along with three other black men. Read my article “Tickets to a Black Abolitionist’s Hanging on Island,” which is published on the Book Blog of the St. Louis Post-Dispatch on line. Would love a poster of this graphic for libraries and classrooms! 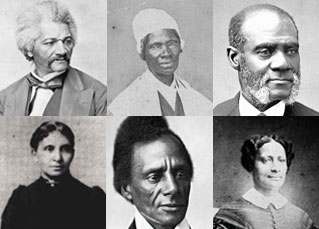 And for myself–I could only name Douglass, Sojourner Truth and Harriet Tubman. Fantastic!! The renewed interest is good. It’s even better when it leads to deeper research. Thanks for providing another pov that really needs to be talked about. Change can come!